Dressing up is not always easy, especially not if you are doing so with a historically themed motif. 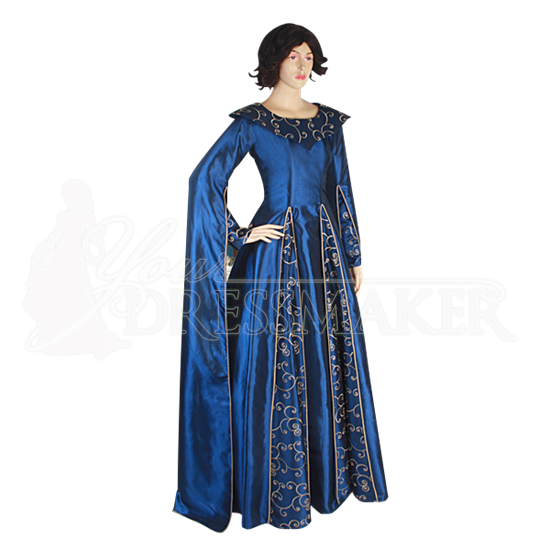 But if you want to look like real nobility, then all you'll need is the perfect dress, and you will find just that in this Draped Sleeve Renaissance Dress. Every inch of this dress sets itself apart from its competitors, creating a distinctive look that will allow any lady to stand out from her peers with ease. The dress is made entirely form fine taffeta fabrics, and comes in five distinct colorations, each of which is more spectacular than the last (pictured above in full detail is the royal blue dress with blue and gold accents). The dress features a unique configuration of solid colored fabric accented with ornamental taffeta in varying patterns, while also featuring floor-length sleeves that add considerable movement and flow to the garment. 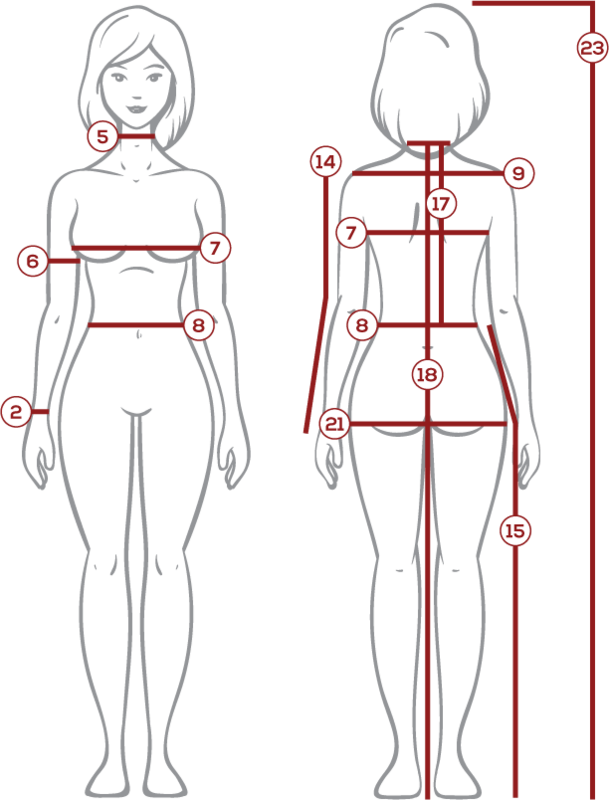 Even more unique is the dress collar, which can be worn as a high standing collar or pressed flat to rest, creating two unique looks! For convenience and use, the draped arms are slit open, so that ladies retain the use of their hands while wearing this dress. 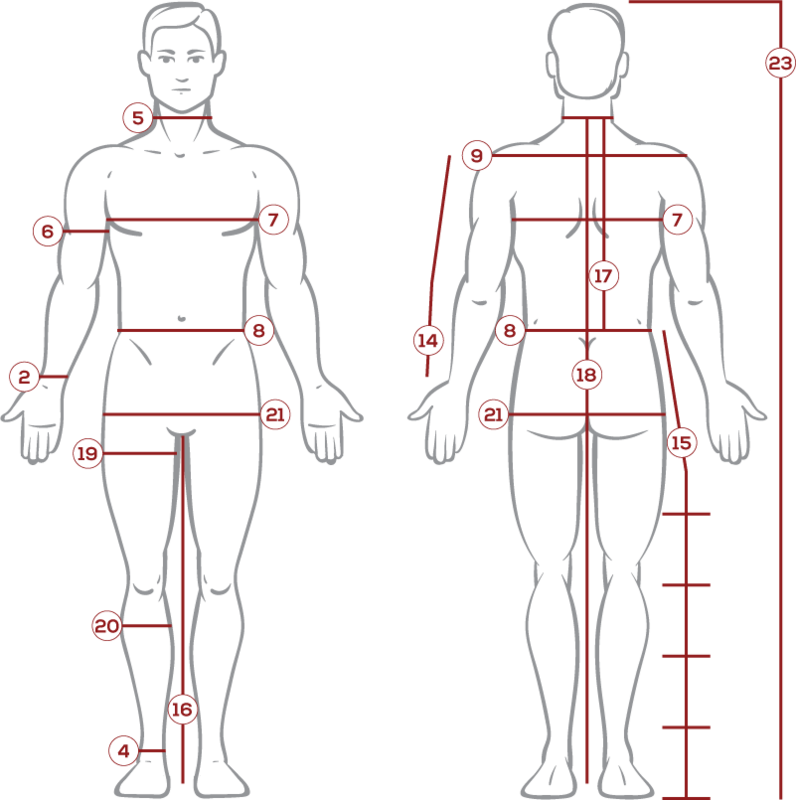 It is available in four different sizes. Please note that the dress is shown here with an A-line petticoat underneath, which provides some body to the gown's skirt (the A-line petticoat is not included, but can be found on this site as item number MCI-145). 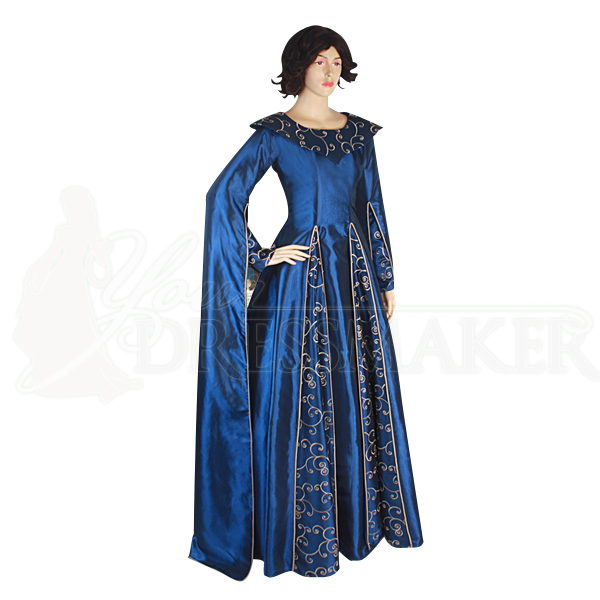 Elegant and lovely, this Draped Sleeve Renaissance Dress is just the ticket to creating your next stunning look, and whether you are going to a masquerade, a medieval ball, or a renaissance fair, you will be sure to steal the show in this gown.